Delivery is normally 5 - 7 days after payment. Graham, Peggy and Jester the cat. Our ten year old cat had to be re-housed due to alterations and was a litle nervous when he was faced with a new penthouse. With a little help and feeding him in situ he has taken to it very well.So we can recommend the Super Cat Penthouse as suitable for the older feline!.. 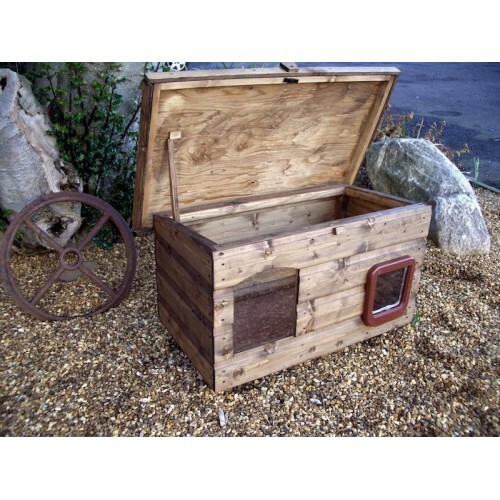 I searched the internet for ages for a "bedroom" for my outdoor cat (her choice-not mine!) to keep her safe, warm & dry through the winter. I came across the Pent Cat House & ordered it straight away. I cannot praise it enough...well made & spacious enough for her bedding and her food bowl if necessary (for those mornings when she doesn't want to get her feet wet to come into the porch for breakfa..
Our new cat house arrived early this morning and it was being used by our cats within 10 minutes of unpacking it! They both normally like to come indoors to sleep during the day (after a heavy night out! ), but they're presently fast asleep in their fab new house. This product is EXTREMELY well made and very pleasing on the eye - great value for money. Mark has kept us fully informed at all times a..
Lovely product and very well made. Need just my cat to go in it now. I think the build quality is second to none and I would recommned this product to anyone looking for an outdoor cat pad. ..
Well made, excellently finished. Sturdy, spacious but still cosy house. No more need to worry if my cat doesn't come indoors at night. Room for food bowl and cat! Extremely friendly & helpful service too. Thankyou..
What a brilliant product!! 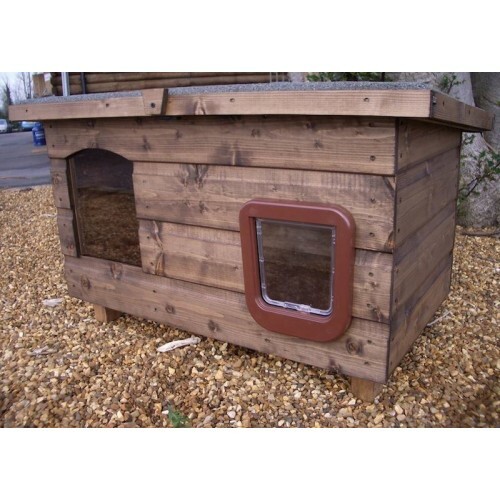 Very well made and looks great on the decking This is the best cat house I've seen and is now well used by Ozzy day and night I would highly recommend the super pent cat house .. I took delivery of this on Friday, and by Sunday the cats were using it. 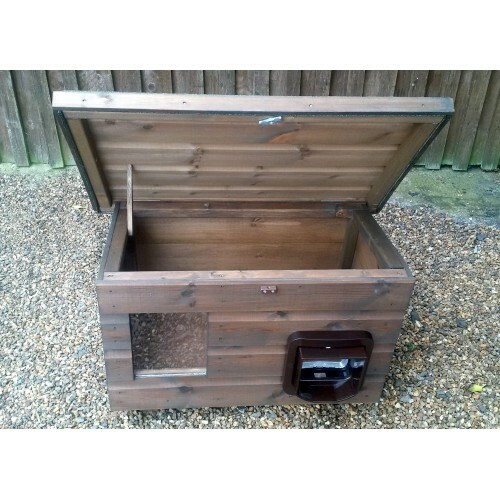 It is so nicely made made and is perfect for the spot I had earmarked for it in the garden. I can see when the cats are in there and when the food needs topping up and the lid stay up whilst I top the food up and put a clean blanket in etc. Highly recommended ..
Well impressed with the cat kennel ,l brought ,came on time ,well wrapped ,and service was really good ,,would like to say a big Thankyou ,,from Chloe my cat ,and myself.. 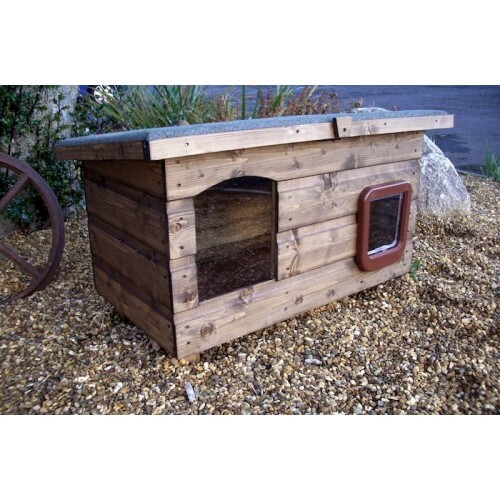 Outdoor cat house thats a warm dry kennel or daily living space for your cat, practical and looks st..